John Tavener was born in the North London suburb of Wembley Park on January 28, 1944. Musical from an early age, he went to Highgate School with the intention of becoming a concert pianist. Tavener's fellow pupils included, amongst others, the composer John Rutter, the pianist Francis Steiner, and Nicholas Snowman, who was later to found the London Sinfonietta, and it was in such an environment that he began to compose seriously. The pieces he wrote during the Highgate years such as Credo and Duo Concertante (both 1961) helped win him a scholarship to the Royal Academy of Music in 1962. Three Holy Sonnets of John Donne (1964) brought the young Tavener into contact with his hero, Stravinsky, who, on taking one look at the score, simply wrote the words 'I know' on the first page. Tavener continued his studies under first Lennox Berkley and then David Lumsdaine, and in 1964 wrote his first opera, The Cappemakers, a setting of the stories of Lazarus and the woman taken in adultery from the York Cycle of mystery plays. It was the premiere of The Whale, in January 1968, which made Tavener's reputation. The first performance was given by the newly formed London Sinfonietta under David Atherton. The piece, a cantata for soloists, chorus, tape and 'men with loud hailers', was enthusiastically received, with Tavener being hailed as the boy wonder of British music. Tavener's music at this time was much influenced by Serialism and collage, and was often deliberately iconoclastic. 1968 was indeed an annus mirabilis for Tavener. In Alium, a setting of a poem by the French Catholic poet Charles Peguy, was commissioned for the Proms, and was written with the acoustics of the Albert Hall in mind; the Proms performance was described by one critic as 'classical music's first love-in'. This was followed by a rave review for Introit for March 27, the Feast of St. John Damascene, commissioned by the London Bach Society. Celtic Requiem (1969) was a semi-staged piece that set children's playground games against elements of the requiem mass, with the first premiere requiring school children to act out the games on stage during the performance. Tavener then came to the attention of the Beatles through his brother Roger, who ran the family building firm. During work on Ringo Starr's home in Highgate, Roger Tavener mentioned his brother's work to Ringo, and this led to a meeting with John Lennon. Lennon and Tavener spent the evening discussing music, and swapped tapes of their most recent work. Tavener by now had been commissioned by the Royal Opera House at the behest of Benjamin Britten (the youngest composer ever to have been commissioned), and was working on an opera based on Jean Genet's Our Lady of Flowers, which he described as 'a black mass.' Lennon decided the following day to record Tavener's work for the Beatles' Apple label, and The Whale, Celtic Requiem, Nomine Jesu and Coplas were all subsequently issued, marking Tavener's debut on disc. Tavener's music of this period is, by his own admission, deeply influenced by his immersion in Roman Catholicism. Although his family were Presbyterians, and Tavener had even occasionally deputised for his father on organ at St. Andrew's Presbyterian church in Hampstead, he had become fascinated with the ritual of the Roman church, and this lead to the high water mark of his 'Catholic Period', with the composition of Ultimos Ritos (1972). This, his first large-scale work since Celtic Requiem, set quotations from the Crucifixus from Bach's Mass in B Minor (he had used the Kyrie in the Introit for March 27) against the poetry of St. John of the Cross. The work showed Tavener's obsession with liturgical ritual, which he also felt to be dramatic ritual at the same time. Ultimos Ritos was to be performed with the choir in the form of a cross, a pattern which was further extended by putting the timpanists in the four corners of the cathedral. The first performance, in St. Bavo's Cathedral in Haarlem (who had also commissioned the work) did not go well: the tape of the Bach fragments did not work, and TV crews, eager to cover the premiere of the latest Tavener, simply got in the way. Nevertheless, the piece was well received. Tavener described Ultimos Ritos as being 'really… about the crucifixion and burial of the self', and with hindsight, it may be possible to detect in the piece traces of a growing spiritual crisis, and a dislike for the Catholic Church which would bloom into a deep loathing. This crisis would become much more evident in the next large-scale piece that Tavener embarked upon. Therese was to be an opera about St. Therese of Lisieux (1873-1897), and for the first time Tavener found himself collaborating with a librettist, the Irish playwright Gerard McLarnon. Although the two men were to become firm friends, McLarnon had never collaborated with a composer before, and was of an opposite temperament to Tavener. In the three agonising years it took to complete Therese, there were strained meetings during which composer and librettist literally came to blows. The opera describes the spiritual crisis experienced by Therese when she was on her deathbed (allegedly dying an atheist). With text from the Song of Songs, it describes her love for Christ, which is shaken by the appearance of Arthur Rimbaud, (a figure introduced by McLarnon), who drunkenly blasphemes before her. The opera ends with Therese meeting Christ in heaven and then returns to earth to witness the horrors of the First World War. The work played to packed houses upon its Covent Garden premiere in October 1979, but was dismissed by the press. Akhmatova: Requiem (1980) the first major Tavener piece to use the Byzantine tone system. The Liturgy of St. John Chrysostom (1977) had caused ill-feeling amidst the Orthodox community in London, who felt that as it was essentially still Western music, and music written by a young upstart at that. The Requiem used the poetry of Anna Akhmatova to pay tribute to the sufferings of the Russian people, and had its London premiere at the Proms in August 1981, with Gennadi Rozhdestvensky conducting the BBC Symphony Orchestra. Akhmatova's work was still banned in the Soviet Union, and before the performance KGB men visited Rozhdestvensky in his dressing room and warned him not to conduct the Tavener. Rozhdestvensky refused. (Upon returning to Moscow, he was forced to surrender the score at customs.) The recording was later issued by the BBC. In 1980, at the age of 36, John Tavener suffered a stroke while at the wheel of his Bentley, and this marked the beginning of a long period of ill health. He still felt that he had not found his mature voice, but began to return to popular acceptance in 1982 with the Christmas Carol The Lamb, a choral setting William Blake's poem from Songs of Innocence. This has subsequently become one of Tavener's most performed and recorded pieces. Although Tavener was writing largely liturgical music in the early eighties (his Orthodox Vigil Service of 1984 being the major achievement of this period), the long road back to popular acclaim had begun. The success of the Blake setting was followed by a major work, Ikon of Light (1983), commissioned by The Tallis Scholars, and premiered by them in 1984 at Tewkesbury Abbey under Peter Phillips. The work, for chorus and strings, sets a poem by St. Simeon the New Theologian (942-1022) that, in its long central movement, Mystic Prayer to the Holy Spirit, describes God as 'uncreated light'. The work is extremely simple, minimal and holy before the term became a marketing label, and employs a palindromic structure, with both the end and the beginning being largely the same. Tavener has frequently returned to the palindrome as a basic building block for his compositions. Also, its lack of development in the traditional Western sense was not a mere experiment: from now on, Tavener's music would move ever further away from the West, which, he felt, had ceased creating any truly spiritual music in the High Middle Ages. For some time, Tavener had wanted to write and opera on Mary of Egypt, the harlot saint who gave up prostitution to live a life of contemplation in the desert. As with Therese, the project seemed to be stuck, with a libretto by Philip Sherrard being dropped, until Tavener met Mother Thekla, Abbess of the Monastery of the Assumption in Whitby, North Yorkshire. Mother Thekla was to become, as Tavener described her, as his 'spiritual mother'. His own mother had died the year before, 1985, and after a period of silence, he returned to composing with Eis Thanaton, a setting of poem by the Greek poet Andreas Kalvos, and Panikhida, a setting of the Orthodox Office for the Dead. Tavener phoned Mother Thekla on a daily basis for advice and counsel, not just on Mary of Egypt, as it was to become, but also on whatever was preoccupying him. Meeting Mother Thekla seems to have released something in Tavener that he had been looking for, his own mature voice. Progress on Mary was slow, and Tavener quickly set the Akathist of Thanksgiving. The text, translated by Mother Thekla, had been written in the 1940s by a Russian priest, Father Gregory Petrov, as he awaited death in a SIbérian labour camp. Taking St. John Chrysostom's dying words, 'Glory be to God for Everything' as his starting point, Father Gregory produced a poem in its own way as remarkable as the St Simeon text from Ikon of Light. Tavener's excitement at composing this piece is due in large part to his successful integration of the Byzantine tone system, with each of the thirteen sections of the work being in a different tone. He also spoke of the work as having little to do with him as an individual; rather it came to him fully formed. The work was premiered in Westminster Abbey in November 1988, and received the most enthusiastic reception afforded to any Tavener work since The Whale twenty years earlier. Tavener's full scale return to popularity came on September 4 1989, with the Proms premiere of The Protecting Veil, a work written in 1987 for the cellist Steven Isserlis. The piece received a standing ovation and the reviews were uniformly ecstatic. The piece was recorded by Isserlis, conducted by Gennadi Rozhdestvensky, and went on to become one of the best selling classical CDs ever. Tavener continued to write for Isserlis, and a second CD, Svyati, was nominated for the Mercury Music Prize in 1997. Tavener discovered one of his other key interpreters in the Indian soprano Patricia Rozario, who was to play the lead in the finally completed Mary of Egypt, which was premiered at Aldeburgh in 1992. She would sing another big part weeks later at the Proms premiere of We Shall See Him As He Is, again featuring a libretto by Mother Thekla. Tavener has remarked that when Rozario sings, she becomes the music. She has performed every subsequent Tavener soprano part, including The Apocalypse (1992), Innocence (1994), Akhmatova Songs (1995), Agraphon (1995), … depart in peace… (1997), Eternity's Sunrise (1997), and Fall and Resurrection (1997). 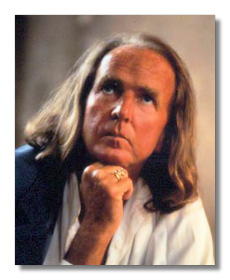 In 1991, Tavener underwent major heart surgery during which he nearly died. This experience led to the string quartet, The Last Sleep of the Virgin (1991), whose music came to Tavener, so he later wrote, as he lay suspended between life and death, and to the large scale setting of The Apocalypse (1991-2), which became another Proms triumph for the composer in 1994. That year, in which he celebrated his 50th birthday, was marked by a Tavener festival in London. The Akathist of Thanksgiving was performed again, the recording later being issued as a best-selling CD. After the heart surgery, Tavener married for the second time, and moved out of Wembley Park to Sussex, and subsequently bought a house in Greece, his adopted homeland. He and his wife Maryanna have since had two daughters. The remainder of the 90s saw his work move in an increasingly Eastern direction, with the composer drawing inspiration from sources such as Sufi chant and Hindu ragas. Pieces such as Agraphon and … depart in Peace have demanding, Indian-influenced vocal parts that a performer trained solely in Western technique would have great difficulty in pulling off. As a result, Tavener began to instruct his performers to study under Eastern teachers before beginning rehearsals. He also found that increased use of Indian microtones meant that he had to modify his notation on the scores, as Western notation proved to be insufficient. Eastern instruments, too, began to figure more prominently. The premiere of Fall and Resurrection in St. Paul's Cathedral on January 4 2000, employed Tibetan temple bowls and even a ram's horn in the whispering gallery. By the time of the Fall and Resurrection premiere, Tavener's name had appeared in the New Year's Honours List: he was to receive a knighthood in recognition of his services to music. Since the inclusion of Song for Athene in the funeral service of Princess Diana and the choice of Acclamation for the Millennium as the piece to be performed on 31 December 1999 at the opening of the Millennium Dome in Greenwich, John Tavener could arguably be described as Britain's most prominent and popular living composer. 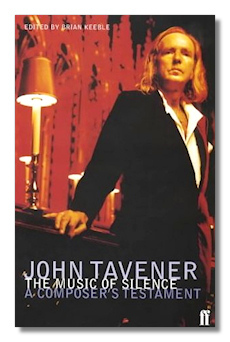 Several weeks earlier, Tavener published The Music of Silence: A Composer's Testament, a book at once part autobiography and part testament, as the subtitle implies. In the book Tavener discusses at length his rejection of modernism, and his embrace of tradition. In tradition, the ancient sources of music, the divinely inspired plainchant and devotional music of traditional societies, he finds a much purer expression of human longing for the divine. This music, he feels, has kept what most Western music has lost, as it is the product of a human relationship with the divine and with nature, not an expression of the composer's ego, or of art for art's sake. Tavener's motto could perhaps be 'art for God's sake'. An expanded version of the 1998 South Bank Show television documentary, which features extracts from performances of As One Who Has Slept (conducted by the composer), Song for Athene, Akathist of Thanksgiving, Three Holy Sonnets of John Donne and Agraphon, as well as an impromptu duet between Tavener and the show's presenter Melvyn Bragg (!). The programme also contains excerpts from biographer Geoffrey Haydon's films on Tavener from the 1970s and 1980s, which are currently unavailable on video or DVD. The TV broadcast of the 4 January 2000 performance, which is also available on CD. The DVD features an interview with Sir John Tavener, as he had by then become.